The Sikh community in Singapore will be paying tribute to Lee Kuan Yew over the week as it joins other Singaporeans in mourning the loss of the nation’s first Prime Minister. Sikh community leaders send their condolences to Prime Minister Lee Hsien Loong and his family on the passing away of Lee Kuan Yew, while remembering his contributions to nation and community. Leading the tribute was Member of Parliament for Ang Mo Kio GRC Inderjit Singh who explained that as minorities, the Sikhs here had much to be grateful to Mr. Lee for. 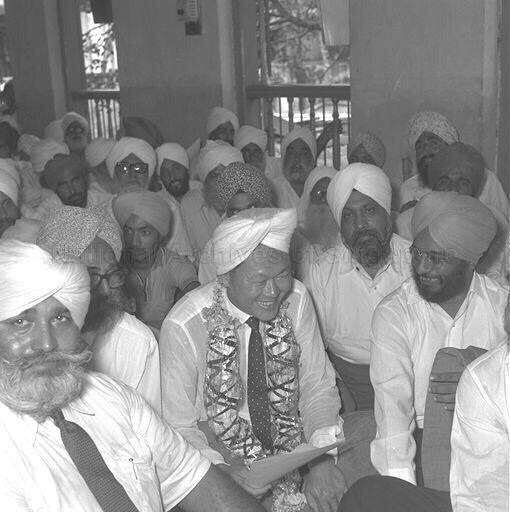 “His emphasis on maintaining racial harmony, meritocracy and advocating minority rights have benefited the Sikhs, just as it has for other minority groups and Singapore, in general. Among other things, he oversaw the establishment of the 5 Non-Tamil Indian Minority Languages, including Punjabi, as recognised second languages in schools here. 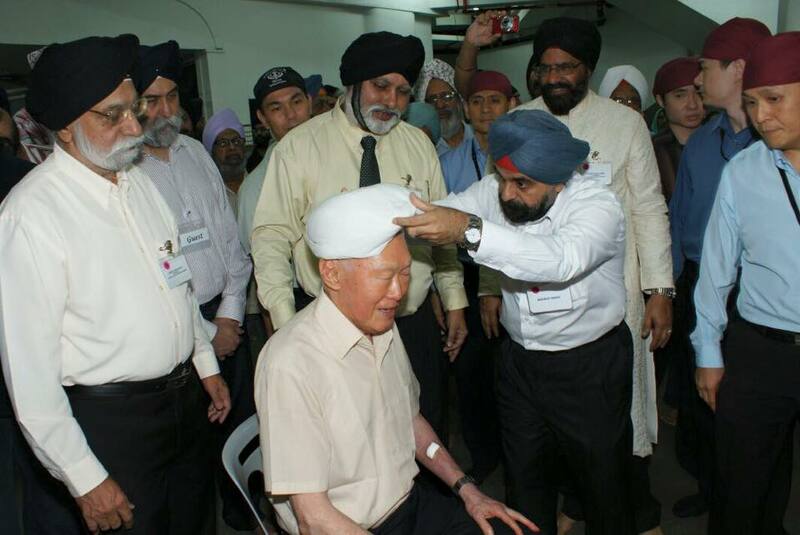 MP Inderjit Singh adjusting the turban on former PM Lee Kuan Yew. Sikh Advisory Board chairman Jarmal Singh added: “He (Mr. Lee) determined his life’s purpose and put the rest of his life wholly into it. The result is Singapore’s success and life fulfilled. Our Sikh Guru’s had said that highest is Truth but higher still is Truthful Living. Mr. Lee lived that. Though saddened by his passing. In honouring his life and bidding Lee farewell, Sikh Gurdwaras in Singapore will be holding Sukhmani Sahib paath prayer sessions over the weekend. In addition, the Sikh community will also be visiting the Parliament House on Saturday morning to pay their final respects to the senior Lee. The contingent, which will include senior community leaders, is expected to be about 500 members. Despite being one of the smallest minority groups, Sikhs in Singapore enjoy a significant visible presence especially in certain sectors such as uniformed and defence services, civil service, academia, the legal profession and in business, among other areas.